Exactly a year back, in March 2018, Beautiful Bengaluru had launched the “Minimum Water Challenge,” which it plans to continue this year. Over the last one year, we have seen many challenges being rolled out across the world, most of which are dares of no significant consequence. But this is one challenge that can have a definite impact on a very real problem the world is facing – water scarcity. 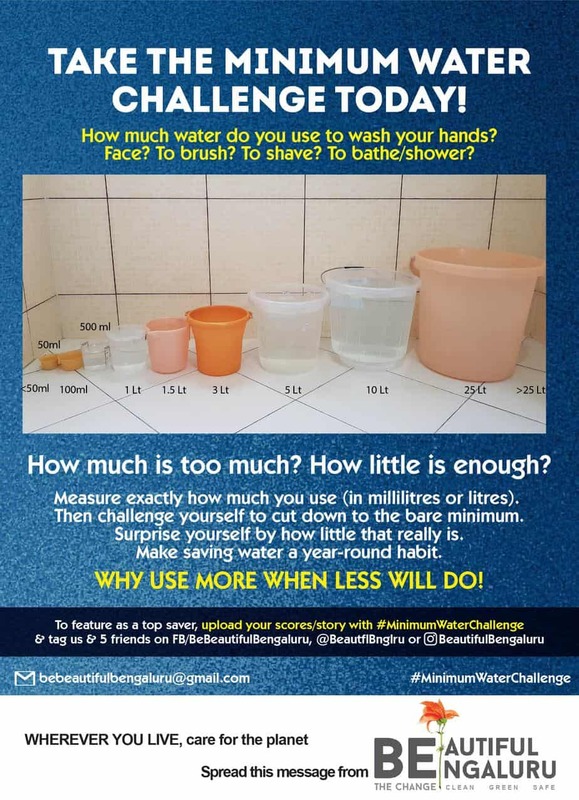 What this challenge pushes you to do is to use only as much water as is needed for a particular task, not as much as is abundantly available. 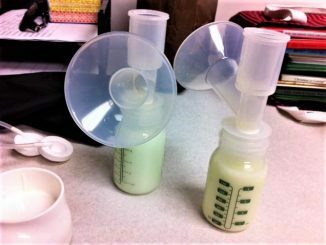 That requires you to establish the bare minimum you actually need for daily use, as against how much you are used to using, and move towards that as a default setting. If we all start doing this, collectively it can have a huge impact on city demand. How do you take this challenge? These are uses in which there is huge potential for drastic reduction in amounts consumed. Measure how much you use currently and then cut it down to whatever is the bare minimum you can manage with, with the same end result! Connect and share your scores to compete for the top savers in each category. Why this challenge at all? Rewind to March 2018 when the world sat on edge – as Cape Town approached D-day. It was scary but yet, it was happening elsewhere. The South African city was forced to adopt a host of near-extreme measures to ensure that it did not run completely dry. However, we in India did not really think we needed to worry, especially as we had water flowing in our taps. Shortly thereafter came the bolt from the blue – when BBC announced the list of world cities likely to run out of water, and Bengaluru was No. 2! Further data indicated that 21 Indian cities would run out of ground water by 2020. But did we do enough? Maybe a small percentage realised the need to cut down but then the summer went by, and almost everyone went back to living comfortable lives. Water tankers shielded us from reality. 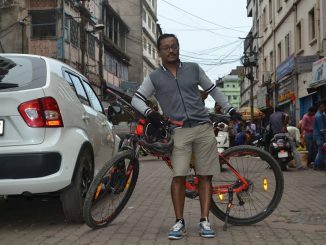 And for Bengaluru in particular, the cooler climate and greenery did not provide those much-needed reminders which blazing temperatures or parched earth would have achieved. March 2019 is here and the prediction is turning horribly true. In Bellandur, where I live, the water table is down to a shocking 1500 feet, with the underground aquifers going dry — a result of year-round insufficient groundwater recharge but excessive withdrawal through borewells. 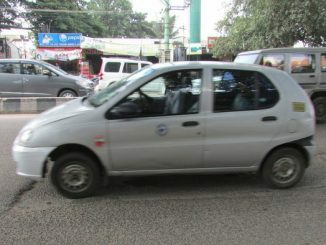 The pattern is similar across Indian cities. Our 2016 video from Beautiful Bengaluru said ‘money cannot buy water when all the water is gone’ and we are eerily close to that, with even tanker water in short supply. We hope that governments will stop illegal borewells, apartments work on rainwater-harvesting/ water-treatment plants and communities actively kick in solutions of recharge wells that may be the only way out. But to complement that, urgent action is needed at an individual level, which is why we hope that every person will take this challenge, especially since most of us use extravagant amounts of water. 8 out of 10 people use 10 times more water than they actually need, some even 50 or perhaps a 100 times more! Measure your current usage in any or all categories. Collect the run-off in a tub and measure. Or measure in a mug or bucket first before using, though this is likely to be less than your actual current usage. If using the shower, check the time you run it for; convert that into litres by extrapolation of how much water you collect in a large tub from your shower in 15 seconds. My shower on full blast wastes 20 litres a minute. 20 minutes in the shower on full blast translates to an incredible 400 litres wasted! This challenge will make you realise how much water is too much and how little is enough. I am able to save 100 litres of water per day just for myself based on these five categories, compared to what I used 5 years earlier. No exaggeration. The implications are mind-boggling for cities starved of water! Consciously start trying to manage with less, once you have established your current usage. Work to discover the bare minimum you really need, and you may be surprised at how little is really enough, without compromising on hygiene in any way. Maybe you can cut down your 15-minute shower to just three minutes, or your three-bucket bath to a half-bucket. If you wash hands with 2 litres, you can probably cut back to even just 50 ml. Is it really possible? You try and tell us! Share your scores on social media with #MinimumWaterChallenge and don’t forget to tag us on FB (BeBeautifulBengaluru) or Twitter (@BeautflBnglru) or Instagram (BeautifulBengaluru). Will you never be able to have a long shower again, singing your favourite songs? Well, if you learn to save enough year round, you can treat yourself to an occasional longer bath! But the most important result of the challenge is that participants will have discovered the bare minimum to manage with, and we will all have learned to use less . So what are you waiting for? 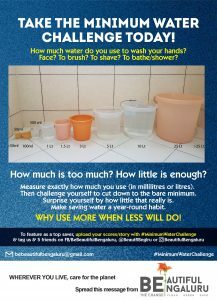 Go wash your face and take the minimum water challenge while you are at it! Aerators can cut needless wastage by up to 80%. Install them. Save up to 60% by turning the tap off when flow not needed – while soaping, brushing etc. Use only as much soap, shampoo, toothpaste as needed to minimise water needed for rinsing. You do not need half a mug to wet your hands or face pre-washing, or half a bucket to wet your body pre-shower. All you need is 10ml pre-handwash and 100ml pre-shower! No need to wet your soap under a tap going full blast! Damp hands on dry soap, less water wasted, longer life for the soap too! Learn to reuse water as you rinse. Let water from one hand pour over the other, removing soap from it as it flows, so you need less fresh water. You do not need a post-wash splurge once you’ve completed rinsing. Continue singing out of the bath! You do not need a second hand-wash or a second shampoo, as many do out of habit. Learn to USE LESS every single time – the savings all adds up! 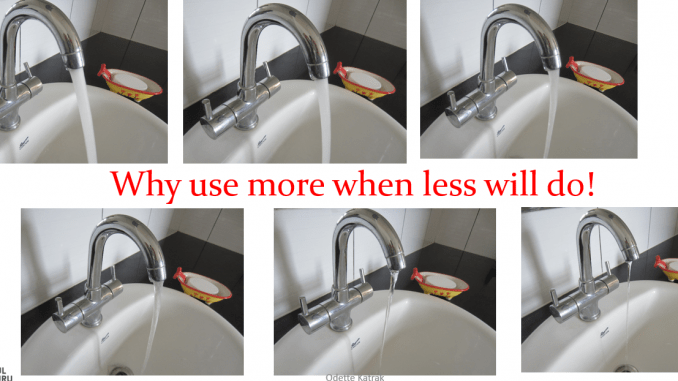 I also suggest that you do not stop at just ‘USE LESS’ which is Principle 1 of my Ecowaternomics theory, on which the Minimum Water Challenge is based. In parallel, also work on principle 2 which is ‘REUSE MORE’. Read my earlier article on how you can effectively work on both these principles. With this winning combination of habits, you can reach a new low in daily consumption. If we all do this seriously, our cities will have far fewer cases of water scarcity. Bangalore Apartments’ Federation (BAF), represented by 400+ housing complexes, has launched a similar challenge. Code named #BAFHalfBucketChallenge, it urges citizens to take a bath in just half a bucket of water. 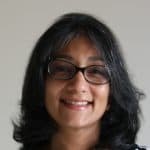 Odette Katrak is a soft-skills trainer, social-change activist and co-founder of Beautiful Bengaluru, an initiative for a clean, green, safe city. Between driver disenchantment and proposed government regulations, will cab aggregators find a way to a sustainable business? Good & thoughtful article. It is the need of the hour that we save water.